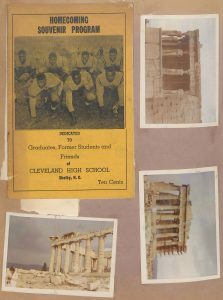 A new batch of 3 scrapbooks from the Cleveland County Memorial Library are now online at DigitalNC. The scrapbooks, at least one of which was compiled by longtime Cleveland County educator, Ezra Bridges, document various aspects of life in Shelby, NC and the larger Cleveland County area during the second half of the 20th century. Most of the materials within relate to activities concerning both the public school system and the African American community in Cleveland County. The scrapbooks’ pages hold a wide range of items ranging from newspaper clippings, to correspondence, to funeral programs, to postcards, to photos, and more. To learn more about our partner, Cleveland County Memorial Library, please visit their DigitalNC partner page or take a look at their website.